Most Tolkien fans only know me as the person behind this website and an avid Tolkien book collector. When I was a kid I started my adventure by reading a well-read copy of The Hobbit. It did not take me long to discover The Lord of the Rings and other books by and about Tolkien. Soon I embarked on a quest to discover anything there was to learn about him. In 1992 I went to some Tolkien exhibitions, and got inspired by them to take my hobby of collecting even further. This was my personal push out of my hobbit hole's front door and it took me into realms I did not even know existed. On the road I learned to know many people and learned many things about Tolkien and the world he had created. Soon I was sitting on a big Tolkien book collection, my own personal hoard and enjoyed it very much like Smaug enjoyed his treasure. One day I decided that while collecting and writing about it online was fun I wanted to meet some other people and started to go to some meetings and once again Tolkien took me to places I would never have been gone before and I learned to know people from all over the globe who I could share my passion with. And so it happened 5 years ago, that I ended up talking with the illustrator Cor Blok, at a Tolkien meeting in Holland. Cor Blok manages to deftly sidestep the slavery to meer representation that most fantasy artists fall foul of. Anyone who has read Tolkiens' On Fairy Stories and letters to Pauline Baynes can see why Tolkien appreciated a more abstract, graphic and symbolic approach to illustrating his work, and understood how representational images provide a too limiting version of something. The majority of illustration commissioned for Tolkien attempts to usurp the primacy of the text by present a visual 'world' that can be entered into, with historical trappings and detail of costume, expression and place that grounds the figures in a singular form. 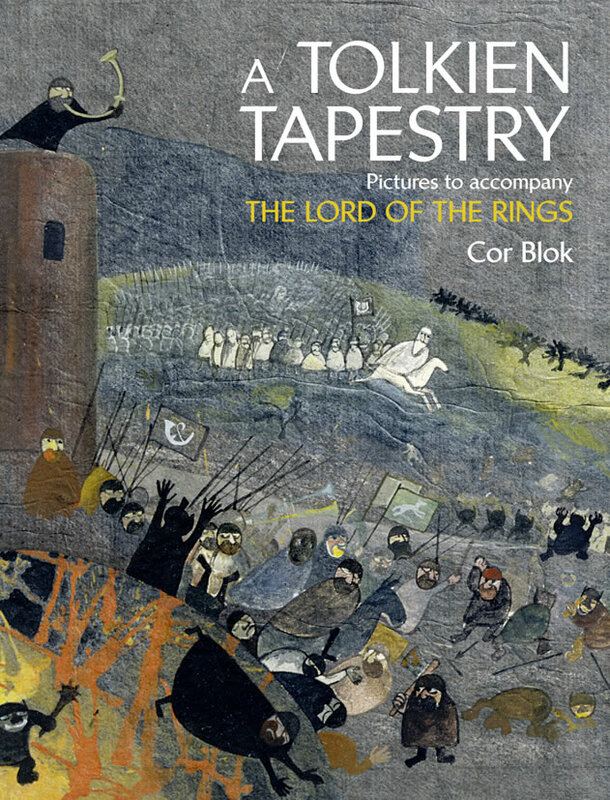 Cor Bloks' images do not infringe upon the imagination of the reader, we do not 'see' Frodo as Cor depicts him, the images leave the viewer free to determine for themselves 'what he actually looks like' in ways that more representational approaches deny. Rather than focus on the detail of an imagined version of Tolkiens' world, we instead can see how characters feel, their relations to each other. By talking to Cor Blok I embarked on one more mission and collecting once again took up another meaning, for I had learned that many of his paintings had been sold and there was no way of knowing how they looked like and who owned them. It took me years to collect all pieces of the puzzle and while at first I had no intention to ever do much with the info, my passion somehow engaged others to aid me and even engaged the publishers and Tolkien family to print a calendar with all Cor Bloks' art. Just like Cor did not need to depict realistic characters I no longer needed to own the pieces I was looking for and enjoyed finding the treasures like any collector enjoys finding a rare Tolkien item. At first I started my quest online looking for any info on Cor Blok's Lord of the Rings that could be found. But it did not take long to realize that, next to the pieces that had already been published in Tolkien calendars, postcards books and Realms of Tolkien, there was not much to be found. Also getting in contact with the artist proofed to be difficult and after writing to all universities and museum where he had worked, no one seemed to know where Cor Blok lived. In the end it was the Amsterdam University Press, who had released his book called Beeldvertalen ('Translating images', an introduction to the interpretation of visual images), which was able to give me his postal address. By then I had also had contact with members of the Dutch Tolkien Society who provided me with info about Cor Blok's past exhibitions and had provided me with some pictures of some of his unpublished art. 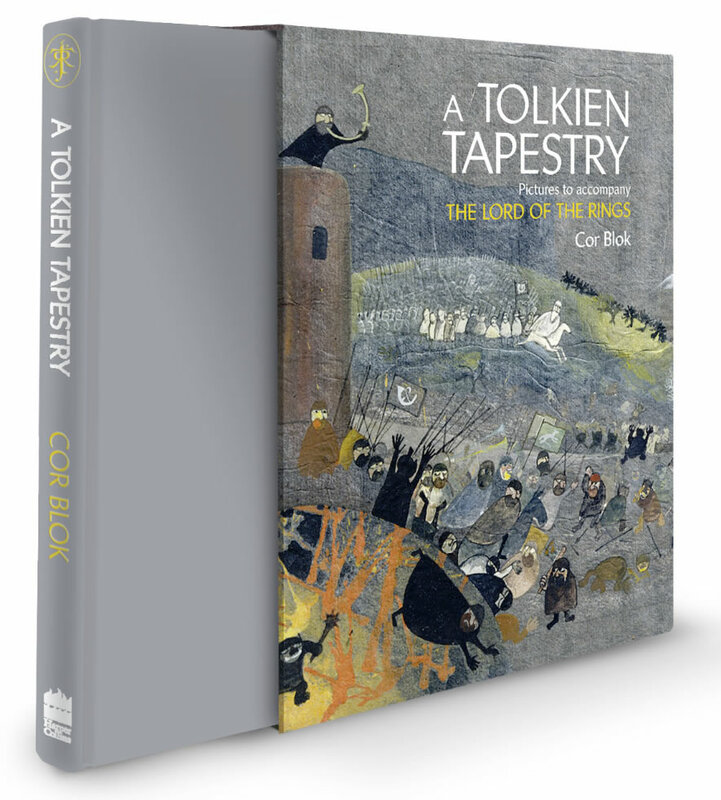 Now I'm happy to announce that the Tolkien calendar for 2012 will present even more Cor Blok art and that there was also released a book that brings together all the Lord of the Rings art by his hand, now exactly 50 years after they were created. The breadth of imagination and powerful imagery inspired the young Dutch artist, and this spark of enthusiasm, coupled with his desire to create art that resembled a historical artefact in its own right, led to the creation of more than 100 paintings. Following an exhibition at the Hague in 1961, JRR Tolkien's publisher, Rayner Unwin, sent him five pictures. 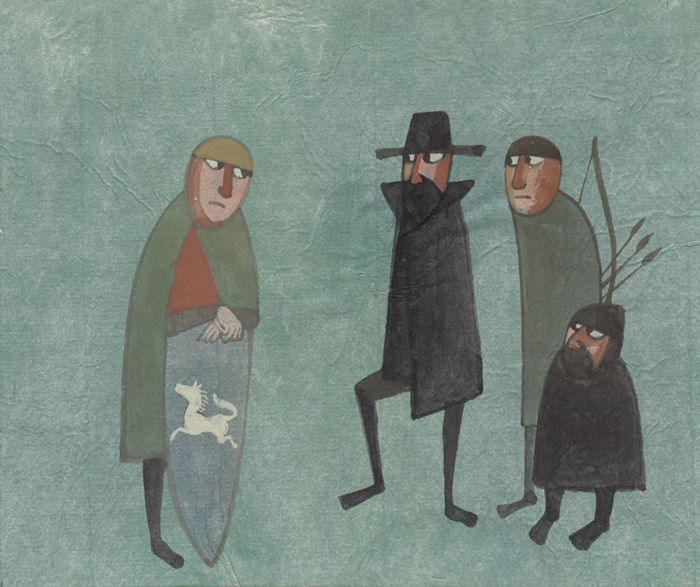 Tolkien was so taken with them that he met and corresponded with the artist and even bought some paintings for himself. Cor Blok was born in The Hague in 1934, and attended the Academy of Fine Arts. After graduating in 1956, he worked at the Gemeentemuseum until 1965, where, among other roles, he compiled a catalogue of the museum's large collection of works by Piet Mondrian. During this time he also painted about 140 pictures inspired by The Lord of the Rings, a selection of which was exhibited at The Hague. When a sample of his paintings was sent to JRR Tolkien this led to a correspondence and eventual meeting with the author, who bought two paintings and was presented with a third. 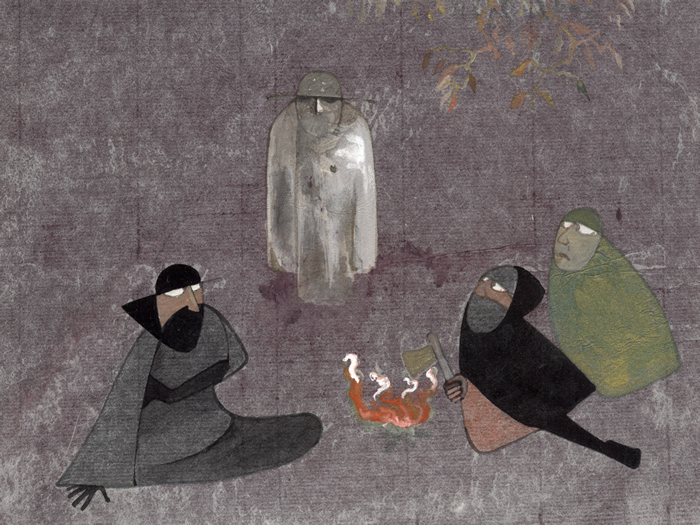 Cor Blok lives in Amsterdam, where is currently at work on a graphic novel. Here you can find a written interview with Cor Blok. And here is a video produced by Librarie Mollat Bordeaux who did an interview with Cor Blok in Paris, France. Since the release of the book in English it also saw two translations. We are now all waiting and hope for a Dutch translation, and who knows the book receives more translations in the near future!? This deluxe slipcased edition is limited to 500 copies and is personally signed by the artist Cor Blok and the editor Pieter Collier (and proud of it!!). The editions are all 500 hand numbered. This edition comes in a nice slipcase. The Deluxe edition looks has the same content as the normal edition, but comes with a limitation page and a very nice slipcase. This book makes the perfect gift for any Tolkien fan, art lover and fans of coffee table books! The last time original art by Cor Blok came on the open market was in the 90's. Many of his art works sold quickly and are now located all over the world. Cor Blok never had much desire to sell any more of his art. Due to personal reasons he now has put up for sale several of his pictures. Enjoy the chance to obtain an original Cor Blok now, it will be the last time his art will ever be available again. Buy original art by Cor Blok here.